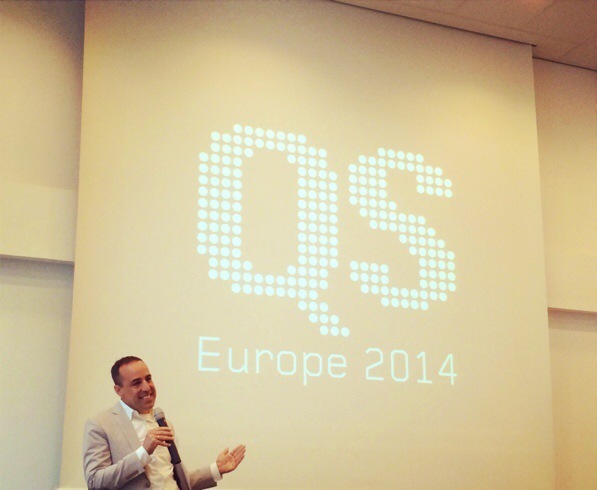 During the weekend of May 10-12, 250 students, scientists, artists, venture capitalists and entrepreneurs gathered at the Quantified Self Conference #qseu14 in Amsterdam, the fifth conference of its kind and the second one taking place in Europe. First timers, not being familiar with the concept of QS, got used to it pretty quickly and absorbed the essential aspects easily, as some of them told me during the breaks. For me, it was a great experience and I learned even more than during #qseu13: the program was even more dense with most session descriptions reading so promising that selecting the "best ones" became quite tough. A nice location (the Casa 400) and a oerfect organisation (you won't find a that kind of catering at other conferences) by Marcia and her team made the #qseu14 a real treat. And yet, this great experience is not the reason for this post. I think that the Quantified Self marks the beginning of the biggest societal shift since the Industrial Revolution. Or, to tone it a little bit down and to limit the claim to the more mundane area of economics: QS is the Next Big Thing. QS is the redistribution of power from experts and organizations to the individual. QS gives autonomy to the individual who, assessing herself through tracking tools and therefore knowing herself quantitavely and - based on data analysis - qualitatively, becomes independent from the opinion leadership of experts like medical doctors regarding the aspects of her health. In this sense, QS stands in a line with technologies and tools enabling billions of individuals of doing things formerly reserved to organizations: the internet itself, providing people with access to information, social media, enabling people to publish their own ideas, or 3D printers, enabling individuals to manufacture real products in their homes: all those redistribute power to the individual. What is so special about the Quantified Self? Compared with the above mentioned technologies, QS isn't about external tools to be used in order to do something you couldn't before. It's rather the inbound aspect of QS: by tracking themselves people start knowing themselves for the first time in history. It's not about learning a new technique, it's about learning about yourself. You use tools like wearable devices, smart clothes and apps to know yourself better and to optimize your lifestyle subsequently. Trying to understand themselves better has kept people busy for centuries. Descartes, Locke, Hume, Nietzsche, Sartre and others pondered on the self, this agent responsible for the thoughts and actions of an individual. And still, the more complex the world has become, the less known the self seemed to be to their "owners". For instance, most aspects of health, being private affairs in earlier times, have been delegated to specialists in this field, medical doctors, psychologists and scientists. Even lifestyle health aspects as losing weight have been occupied by nutritional experts - may it even be the ubiquitous yellow press diet recommendation. And although we're living longer than ever - the global life expectancy has improved to 68 years for men and 73 years for women - many health problems seem to be unsolvable. Obesity alone costs the U.S. health system more than $150 billion per year. So-called diseases of civilization have occurred or risen within the last decades, such as diabetes, cardiac diseases, specific types of cancer. And the proposed solutions of the health industry and its proponents is to cure the symptoms of these sicknesses, to produce more effective drugs and to develop the best therapies for so-called chronic diseases. As a diabetes patient, you get the diabetes treatment. No matter, if you are a 45-year-old mother, a 22-year-old obese student or a 72-year-old sporty pensioner, you get more or less the same diabetes treatment. What if it were possible to get the treatment which exactly matches your individual personal physique? What if the treatment took your complete lifestyle into account and would be adapted to your daily behavior? Or - even better: what, if a treatment would start with the prevention of diabetes by providing you with helpful advice regarding necessary behavior change based on the analysis on your realtime body data? Any health system in developed countries is based on fighting the symptoms of diseases, and on nurturing healthcare industries which need to retain their patients by providing them with drugs keeping them loyal customers. As long as the individual depends on the healthcare industry alone, he won't get cured of diseases of civilization. There is an opportunity to leave this system, and this is the Quantified Self. As soon as the individual is provided with unbiased realtime data about his body, he can realize impending health risks and act accordingly by changing his behavior to prevent a disease. Or, he gets qualified recommendations regarding his lifestyle in order to reduce the negative effects of his chronic disease, or to even recover completely. For sure, not everybody wants to know everything about himself, perhaps because he feels that the data would show that he's in a very bad condition. Or, some people might just be quite insensitive towards their own health as some behaviors, such as smoking, seem to imply. And, as always, people will have to get used to track and analyze their body data consistently, as well as to learn to change their behavior based on recommendations. This latter aspect - how to motivate people to change their behavior - will be discussed in one of the next posts. The Quantified Self is not a technology, and it neither is an industry. It's rather a movement, a lifestyle enabled by technologies such as apps, wearable device's sensors and algorithms which translate body data into meaningful stories about human behavior. The Quantified Self is not powered by inventions, it isn't owned by companies and it isn't 'protected' from innovation by patents. The Quantified Self is powerd by the people, by individuals who realize that they have the ability to know and to make sense from all their data. By quantifying herself, the individual is the one who knows herself, who can change herself and therefore who can change the world. As soon as the individual becomes aware of her newly gained power, her re-gained autonomy, she will use it. And with her, billions of people. In this post, I have pointed out the impacts of the Quantified Self on health care. There are other areas of life where we will see similar disruptive effects, e.g. education. Knowing your data makes the difference. And that's why I think that the Quantified Self is the Next Big Thing. What are your thoughts? Would love to read them!